Legendary guitarist still pushing the edge musically. In 1969, the Woodstock Music & Art Fair catapulted Ten Years After and their young guitarist, Alvin Lee, into the spotlight. Seemingly overnight, the band went from playing clubs to arenas and, by 1973, Lee had had enough of the lifestyle and of being expected to produce hits. He was tired of being just product. 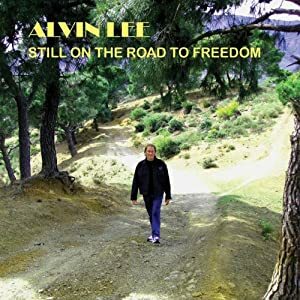 That year, he released his first solo album along with Mylon LeFevre, the star-studded On The Road To Freedom. Now, nearly 40 years later, Lee is back with a sequel of sorts, Still On The Road To Freedom. The album leads off with the title track, building slowly from an acoustic intro as Lee adds layers of fine guitar work to the song. With its bird chirping sounds and blend of acoustic and electric guitars, the track fits in stylistically with Lee’s late 60s/early 70s heyday. Lee invokes a swamp groove on the next track, “Listen To Your Radio Station,” which adds some modern production touches before going into a jazzy interlude. While the combination may seem odd on paper, it works well for the track. Tim Hinkley’s organ adds a Booker T. and the M.G.’s feel to the bluesy “Midnight Creeper” with Lee adding tasteful, understated leads to the song. Lee invokes the Bo Diddley Beat in “Back in 69,” a humorous ode to how the hippies of the 60s had to grow up and face real life. Lee’s solo blends Billy Gibbons with some jazz before the song veers off into a brief funk break. Lee’s playing throughout has shown no signs of age as he easily switches between musical styles. “Down Line Rock,” for instance is a 50s-styled instrumental rocker that is just screaming for some Jerry Lee Lewis piano breaks. Lee revisits his old band with a cover of “Love Like a Man,” now titled “Love Like a Man 2.” While similar to the original, the new version has a decidedly harder edge to it with Lee’s guitar in particular showing more bite than before. Lee has followed his own muse for many years now and is still putting out excellent music. His latest release shows that he is Still On The Road To Freedom.